As Travel: An exciting trip, and likely a long one to an exotic place by motorcycle, car, bus or train. As Change and Movement: Like the teen years, Knights are about maturing, changes, movement and the Knight of Wands would suggest things switching, moving, or changing rapidly. Energy, in particular, might go up or down dramatically. In the negative, there is a fighting atmosphere to this Knight, the time or environment may be electric with an almost sports-like desire to do battle, even when it might not be wise to do so. Changes won't be frightening, but they may seem wild and unexpected. 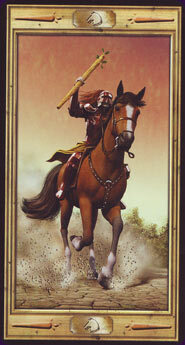 As a Teen or "Teen-like" Person: The Knight of Wands is the "tilting at windmills" Knight. The kind of youth who always goes for grand, dramatic gestures. This is the restless teen or teen-like adult who loves his car and seems to live in it, driving everywhere, picking up his friends as he goes. And there is usually no telling where he'll drive to or end up. He's popular, the center of attention, the leader who comes up with crazy ideas. He'll be voted class president or Prom King, and is likely an aggressive player on the football team, but don't expect him to be all that serious or serious minded. He's at an age where he wants to have fun and party. On the negative side, this teen can be headstrong, bossy or a bully-and a risk-taker, meaning he could do dangerous things and convince others to do dangerous things. A little narcissistic, he's not always sensitive to others feelings. Don't expect him to be reliable or on time, but he can be fiercely loyal to his friends, and his religion whether that is sports, a philosophy or church. Learn the Knight of Wands tarot card meaning and the rest of the card meanings, symbols and stories in our eBook.